A couple of weeks ago, The Man Bird and I really couldn’t be faffed to cook and The Chick was screeching for food; nothing else for it but to order take-out. After the usual rounds of “What do you fancy?”, “I don’t know, you choose”, “Chinese?”, “No”, Indian?”, “No”, “Well what DO you want?”, we eventually decided on Pizza. Tonight, as is so often the case, Chickadee disappeared out with her mates, leaving us ‘rents all on our little lonesomes. 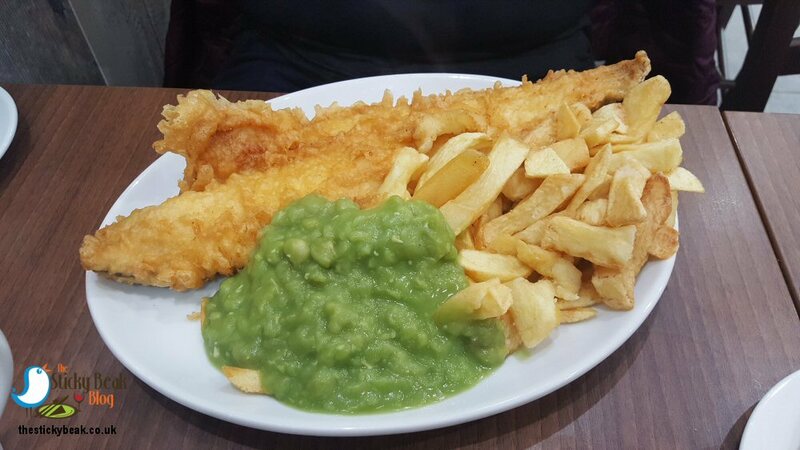 His Nibs looked at me and said “shall we have a sneaky fish n chip supper at Mario’s Fish Bar?” Well, I didn’t need asking twice! It was really busy at the counter when we got there, not quite so busy in the restaurant bit - we snagged a table easily enough, with 3 or 4 others unoccupied (not for long). A lovely lady came and took our orders, and we took in our surroundings in a bit more depth. 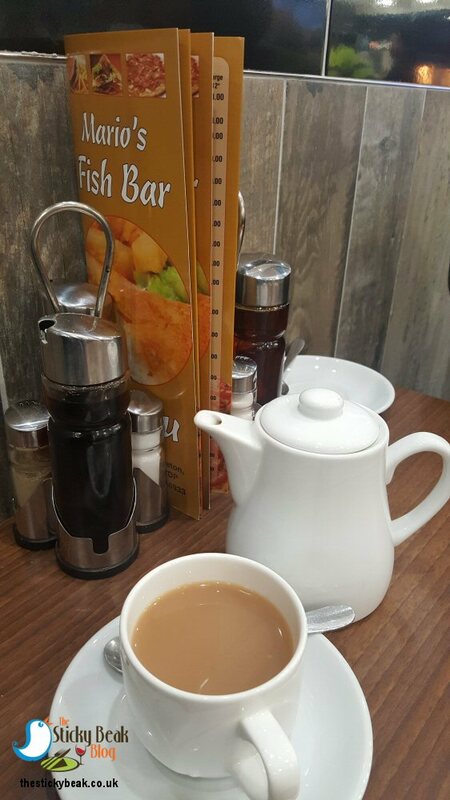 I had the 10-12oz Haddock that comes with a choice of Peas, Beans, Curry, or Gravy (I had mushy peas) a slice of bread and butter, and a choice of hot or cold drink (I had a cup of tea) - this cost £8.50. 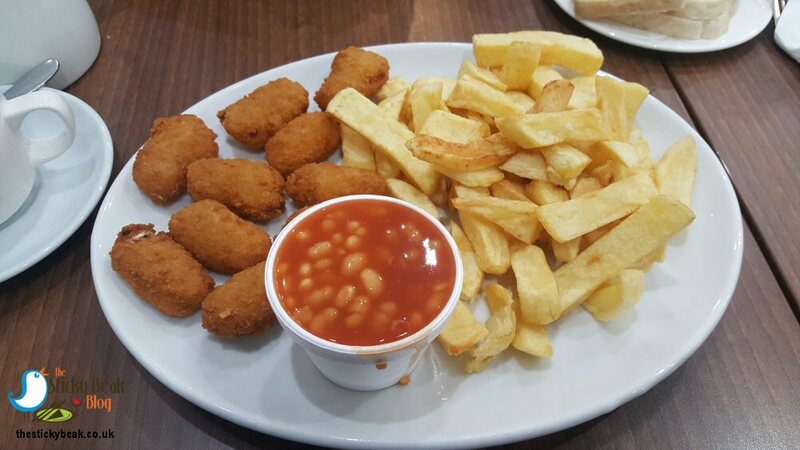 The Boy Wonder had 10 pieces of Scampi, although he had beans with his; like me he had a cup of tea with his meal which cost £7.20. Now nobody’s pretending that it’s the Ritz Hotel restaurant in Mario’s Fish Bar, but it’s perfectly good nonetheless. 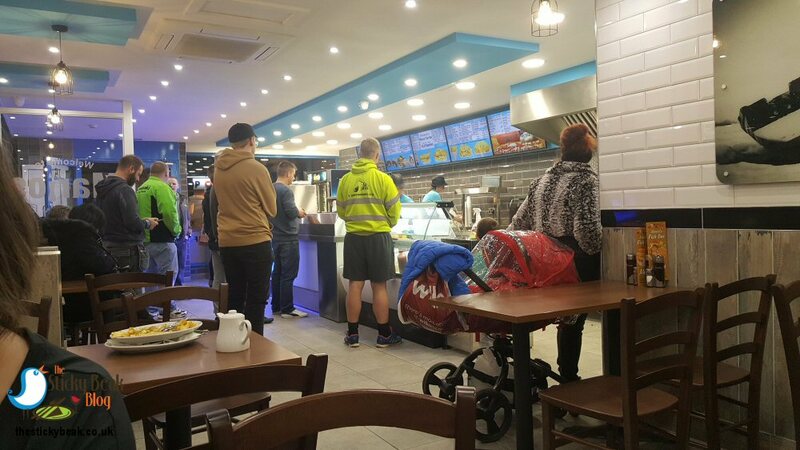 The premises are kept very clean, and there is minimal smell from the fryers - thanks to some seriously powerful extractor fans. There are prints of fishing photographs on the walls, which are tiled with trendy high-gloss white brick-shaped tiles. Hygiene facilities are located behind a fantastic muralled door on the far wall. When our food was brought over to us, it was piping hot, and generously sized; Mario’s do a smaller fish portion for those who feel they couldn’t manage the bigger size. The chips tasted delicious, and weren’t greasy at all, which pleased me no-end as I tucked in. I always have to have salt and vinegar on chippy chips, don’t ask me why, and I’m also rather partial to plenty of vinegar on my mushy peasJ. This last point came in rather handy; let’s just say that the vinegar doesn’t trickle out of the bottle, it’s more of a river! So, remember to go easy on the pouring angle if you want vinegar, or you’ll get more than you bargained for. His Nibs thought the Scampi pieces were a great size and very tasty; by the speed they disappeared down his gullet I was in no doubt that he was enjoying themJ . The chap on the table across from me was tucking into a very nice looking chicken kebab, salad and chips; next time we come I’m going to have that. Our server was really friendly, and we weren’t waiting long at all for our meals despite the take away part being exceedingly busy.